BASKETBALL SPOTLIGHT NEWS: Holloway Headed Back To Future Phenom Camp! The Basketball Spotlight Future Phenom Camp Class of 2023 got another boost after national ranked guard Aden Holloway has confirmed his appearance. Holloway starred at the Future Phenom Camp last summer playing in the Top 20 Game, and winning the best playmaker/passer award. After the camp, he shot up to the #3 player in the country according to our national rankings. 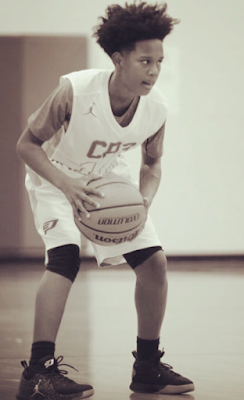 Holloway spent this season playing with the GC Ballers (2023) and National Champions CP3 All Stars (2022). Aden will be joining some of the top players in the country at the Future Phenom Camp. Make sure you register quickly because spots are going fast and a sellout is near. The Future Phenom Camp will take place August 26th and 27th in Boyd, MD.